"But Stray Dogs is going to be on this show called Ginormous Food. You're a food writer. Why haven't you been there?" To be honest with you...we don't know. See, we were big fans of the previous occupant, Zona 78, especially their Danish Blue pizza that featured a ton of stinky blue cheese, oh man...so good, and when Stray Dogs moved in we always said that we would go there and investigate but, well, it just never happened. The original plan was to try out this new deli on 1st Avenue but when we got there we discovered that it had yet to open. Maybe we should have called first? So plan B was to finally go to Stray Dogs, order a bunch of stuff and see what happens. Pickles or just squishy cucumbers? It was a pretty hot day, an hour or so after the lunch rush, like 2pm-ish, and we were ready to get down. Some lunchtime stragglers were hanging out on the small patio in the front and the place was relatively empty except for a table of old ladies that gave us the murder eye when we walked in. Why the murder stink eye? We don't know. I mean, we looked okay, there was just three of us, but I guess a small crew of "yungins" moving in on their lunchtime turf was ill advised. And we're not even that young. Anyway we found a table next to a window, opened the menu and made some decisions. 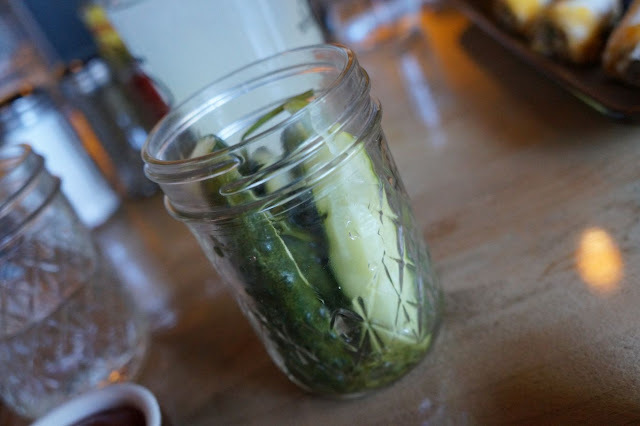 As serious pickle fans we had to get their pickle jar appetizer. 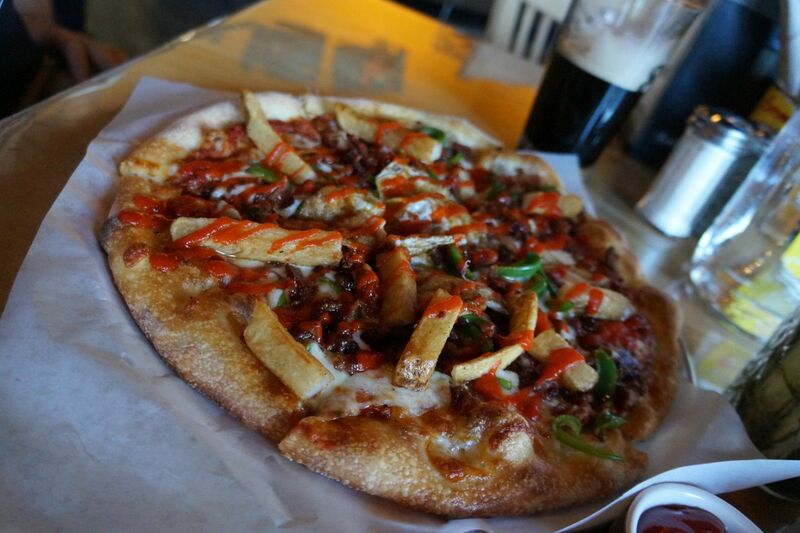 Then we settled on some chicken taquitos, the burger of the day and a pizza called the Hair Of The Dog that features bell peppers, bacon, eggs, French fries and then finished with a sriracha drizzle. Even though we are kind of done with sriracha this option just sounded too dumb to pass up. Then for later we had to get the always blogged about Munchies milkshake. This thing comes with a chocolate frosting rim decorated with M&Ms, potato chips and pretzels, a Rice Crispies treat and cinnamon sugar donut holes. C'mon now...how could we not order that thing? That's the milkshake that's going to be on that show right? The service was fine but the beer selection is pretty boring. It's okay but we sort of expected something a little more adventurous from a place that boasts wild food. We settled on a Barrio Mocha Java Stout (which was quite lovely), a Dragoon IPA (which always delights) and a Sierra Nevada rotating beer called the Sidecar, which was an orange pale ale. Meh. First to come out was the pickles and chicken taquitos. Hate to say it but...those weren't pickles. They tasted as if someone cut a cucumber into spears and threw it into some salty water overnight. Not good and not crispy. Very disappointing. Two of us at the table make our own pickles and its not that hard to get an even somewhat decent pickle. It just takes a little effort and a little more time. Unless they fix their recipe, Stray Dogs needs to change it from "pickle jar" to "jar of slightly salted cucumbers". 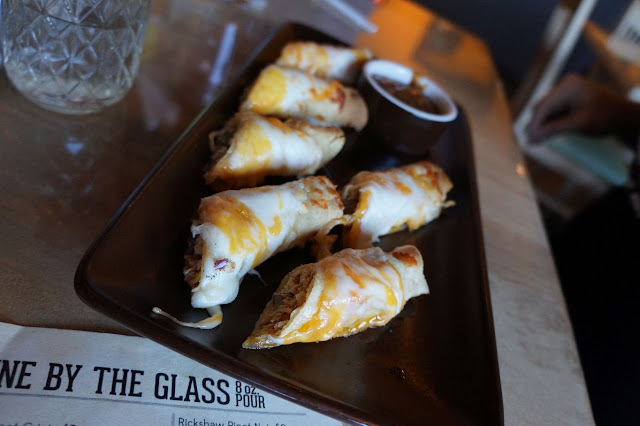 The chicken taquitos were thankfully tasty. Not a whole lot of seasoning but the chicken was cooked well, the cheese wasn't overly cheesy and there was a good crunch on the tortilla. What totally saved this dish though was the salsa. Get that stuff in jars quick and sell it. A nice heat, good roasted flavor and the peppers tasted really fresh. Next up was the burger and pizza. The burger patty had a fine flavor, it was cooked alright and the large side of fries were definitely the star: hand cut and seasoned perfectly. The veggies that came with it were nice and fresh but the bun was really greasy which was kind of off putting. Note to Stray Dogs: Do not add grease to your hamburger buns! The Hair of the Dog pizza was actually kind of fun. The various toppings somehow worked and we didn't mind the sriracha element, in fact we rather enjoyed it. The sauce on the pizza was tasty as well, not too heavy handed, and the crust was cooked evenly. Thing is, this pizza is really hearty. We were only able to take down half because of all of the other items we sampled and we still had to make room for that milkshake Godzilla. 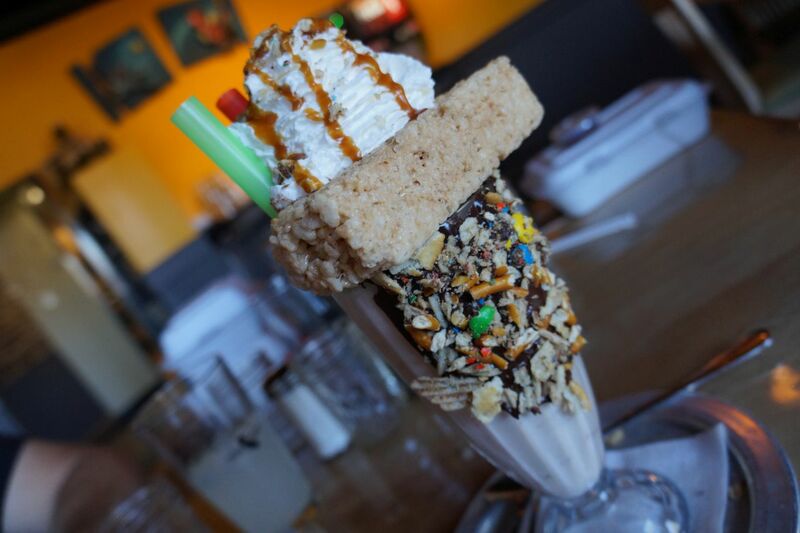 Speaking of which, when all was said and done The Munchies milkshake made it to the table. Yep, this thing is kind of glorious. It was tall with a lot of color and a lot going on. The chocolate sauce bark cascading down was a sweet, salty and crunchy delight. The ice cream was delicious, really firm but creamy, with lil' bit of donut floating at the bottom which made for a sugary doughy surprise when you sucked it down on these really wide straws. The Rice Crispies treat was the only thing that fell flat. It just didn't do anything. Didn't make sense with the shake, didn't have much flavor, was kind of dense and boring. That said, what made this whole trip and experience worth while were just two little things dangling from the straws. Don't know how to properly say this but they were some of the best donuts we've ever had. Perfectly fried, perfectly seasoned, perfectly sweet and just plain perfect. 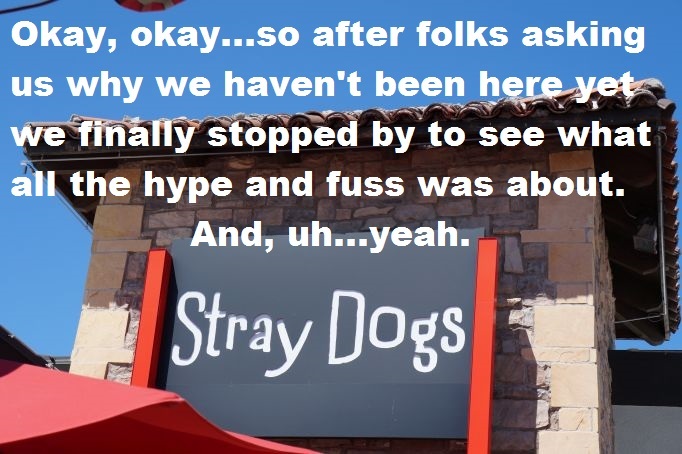 Stray Dogs needs to take out the GS in their name and replace it was NUTS and just be a straight up donut shop. Luckily they sell them individually so next time we are in the neighborhood you better believe we're getting a dozen and locking ourselves in a dark room, eating them as we cry as a donut glaze of shame overcomes us. This was our first experience at Stray Dogs but we feel it wont be the last. Sorry it took so long for us to get there but with other food writing obligations we can be a bit slow on the take these days. But now that we are hitting a grove with the new gig we promise to blog more often. 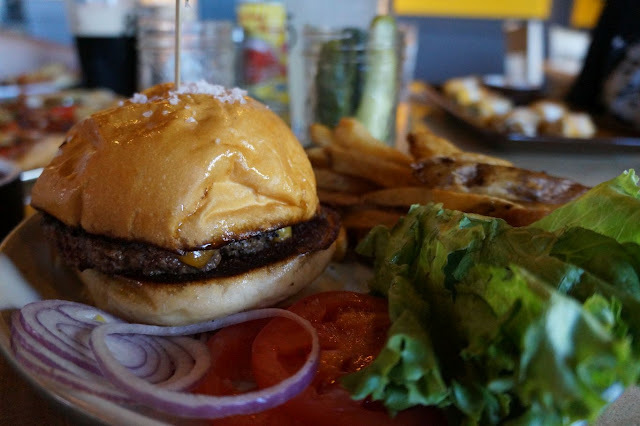 There is a lot going on in Tucson, food and drinking wise, and we plan on covering it as much as humanly possible. Thank you Stray Dogs for the hospitality. Sorry we had to come down on you for a couple of issues we feel are totally workout-able but overall we had a great time and will try to come back and try some actual dogs and other things. Let's hope those things make it on that food show.